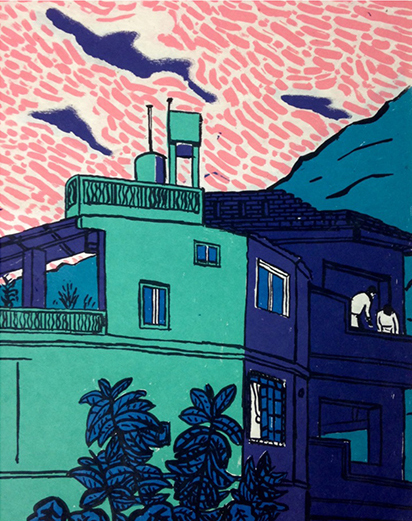 Gaurab Thakali is an illustrator printmaker, from Nepal and currently living in London. Gaurab studied Foundation Diploma in Art and Design and BA Illustration at Camberwell College of Arts. Tom Caron-Delion is a photographer from South London, who makes work of an immersive, documentary nature, he also studied the Foundation Diploma in Art and Design at Camberwell College of Arts and then studied BA Photography in Brighton University. The two artists held an exhibition ‘Thik Cha: An Exhibition for Nepal’ at the Embassay Tea Gallery, Southwark 21 – 24 January 2016. The exhibition explored a joint-journey project they undertook last year to Nepal. An insider and outsider documented everyday life in Nepal as they traveled together; Gaurab created limited edition screen prints from drawings he made during the trip, and Tom’s photographs focused on the people they encountered. Gaurab’s screen prints represent the countries environment with a sense of familiarity, but also with the distance of having been away for the last ten years. The brilliant colour he employs and the Nepalese paper he prints on, references traditional Nepalese art, but the prints still embody his signature style of illustration that he acquired and developed in London. While Tom’s photographs are not only of the people he met in Nepal, the images also document the extraordinary amount of rebuilding taking place in the wake of the earthquake. In doing so his photographs suggest something of the goodwill and tenacity of the Nepalese people. Predominately shot using a medium format camera, his images capture the incidental detail of people going about their ordinary lives in extraordinary circumstances. 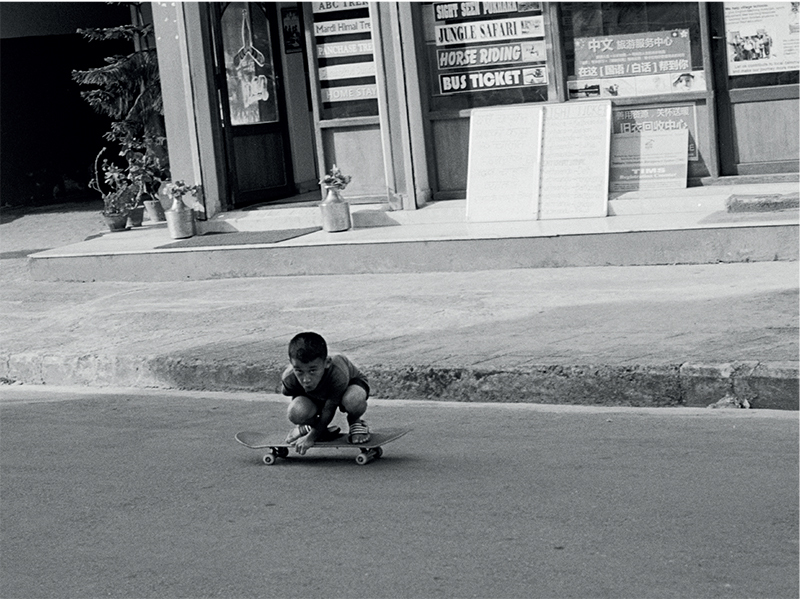 At the centre of his photographic project you are introduced to a small but thriving scene of skateboarders in Pokhara, a group that wholly accepted both artists into their community and proved that the language of skateboarding is universal. Gaurab answered some questions about their journey to Nepal and how the project came about. How did you and Tom meet? Tom and I met through skateboarding about nine years ago. What led you to the joint-journey project in Nepal? We applied for a project called Young and Laced (each year they take on 12 young creatives) funded by Converse. Once our application was accepted we had a couple of meetings and they were looking for us to work together. Tom had already worked on a project in which I was part of. I guess that’s when we decided to pitch our idea of going to Nepal, as Tom wanted to go there to document the place where I am from as it worked as a continuation to his earlier project. The recent disastrous earthquake pushed us even more to go over there and record the aftermath in our respective disciplines, through photography and drawing. When and for how long did you travel to Nepal? We were there for about a month, from the end of September to the end of October 2015. Did you feel like a tourist or an outsider returning to Nepal and viewing the country as an artist for this project? I suppose not that much, even though I moved away from there 10 years ago, as I feel like the culture is strongly ingrained in me. How did you and Tom get on traveling together? It was good and it was the first time we had traveled together but we got along pretty well. How did you find recording everyday life in Nepal after the earthquake? Well both of us didn’t want to take a direct approach, we had the idea for the trip before the earthquake had happened and we didn’t want it to take over the concepts. For me I looked at really mundane elements of life and structures, so I almost bypassed the destruction that was surrounding me and looked at what was still standing. This is juxtaposed by some of the photographs that Tom showed that featured empty shells of buildings that construction had stopped on but people were living inside, or sites where buildings had been that were, that are now at the very early stages of redevelopment. In Nepal there isn’t much health and safety or building requirements, people just build, which is one of the reasons why there was so much destruction in the capital of Kathmandu after the earthquake. These photographs show this but also show people moving around and living in these sites, just getting on with everyday life. Could you explain more about ‘Thik Cha’ and why you decided to use this as the title for the exhibition? ‘Thik Cha’ is a word equivalent to ‘OK’ in English, it can be used as a question as well as an answer. It perfectly reflects a relaxed yet purposeful way of life in Nepal. The words really stuck out for Tom too, as we spent more time there travelling and talking to the locals. How did you feel your illustrations and Tom’s photographs complemented each other in the exhibition? The project was interlinked from the start as it was a shared experience, where we would stop off at places for Tom to take photos or for me to do a drawing. I’d often ask Tom to take photos for me so I could work on the drawings that I couldn’t finish on the a spot. The work we showed at the exhibition also crosses over quite a bit in terms of visual ideas like composition, architecture, people, environment, mood and colour. Other than showing everyday life of Nepal, is there anything else you hope the exhibition says about the country to those who view it? Well there is the element of skateboarding which is represented in the photographs; an activity which is not widely done in Nepal but we wanted to find skateboarders because we knew that it was a tool we could use to surround ourselves within a community. I think you can tell by the images of people that there is this acceptance, a distance which is present because Tom was an outsider to the culture of Nepal, but also a willingness to be in the images and be part of what we were doing because of the shared common subculture of skateboarding. I think that what else comes across in the photographs is the kind spirit and goodwill of the people we encountered. Which again relates back to the title ‘Thik Cha’.